It’s funny what you find yourself working on. I never once imagined that as a local government head of comms that I’d be punting weddings and getting excited about soft focus pictures and ivory dresses. But that’s exactly what we’ve been doing over the last few months. In the past two years both the county’s biggest employers have closed down and without a city in our patch we’ve had to think a bit more laterally about the ways of bringing money into Northumberland. Tourism is an obvious one but we do lots on that already, so we eventually developed a really nice campaign to promote the county as wedding destination. Across Northumberland we have 72 wedding venues ranging from the small and simple to some of the finest castles in Britain (including the one used as Hogwarts in the Harry Potter films) – You can check out our brochure here. Most of our rural communities have a venue near them and the investment that wedding parties bring is invaluable to employment and in supporting small business like photographers and florists. 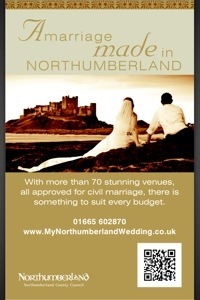 We wanted to raise awareness of Northumberland as a great place to get married. The beautiful countryside, unique setting, fantastic range of venues and wonderful scenery can all combine to make that special day even more special. By promoting Northumberland as one of the best places in the country to get married we think that we can achieve a wide range of benefits. So ‘A marriage made in Northumberland’ was born and it aims to bring more people into the county and provide a boost to the local economy through the direct and associated local spending of wedding parties. These weddings, which often include hundreds of guests, will also serve to showcase Northumberland as a destination – making it more likely that guests will return later as tourists. 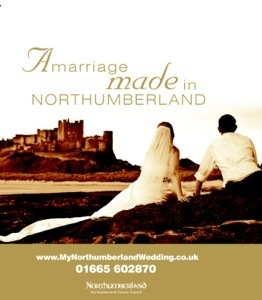 In terms of results the ‘Marriage made in Northumberland’ campaign has already started bringing much needed money into the local economy and raising awareness of what this great county has to offer. Since the campaign started weddings have increased by 15% and if you use the ONS average spend of £16,000 for a British wedding, that’s almost £1m of additional cash brought into our local economies. As well as this, thousands of people have downloaded the wedding brochure, looked at the website, seen our posters or heard our radio advert helping to boost bookings and increase the total number of ceremonies. So if you want to get hitched why not do it in style and come to one of the most rugged and beautiful counties in Britain, the only thing we can’t promise is a boy wizard.